Specsavers, the optical retail chain, has launched “Crop Circles”, featuring a West Country farmer, dressed in very bad glasses, who tells a documentary crew about the strange alien spacecrafts that regularly visit his farm and mess-up his crops. But why are they picking on him? The commercial features the £25+ glasses range and marks a shift away from 2009’s value message, which used scripts focusing on poorly sighted people in need of site tests, by returning to the retailer’s original strategy of using ‘Should’ve gone to Specsavers’ to promote its product range. The campaign was launched on television throughout the UK on 24th January. ‘Crop Circles’ sees a stereotypical West Country farmer, dressed in very bad glasses, tell a documentary crew about the ‘aliens’ that regularly mess-up his crops. The film ends with the poor old farmer feeling victimized, saying “Why here? 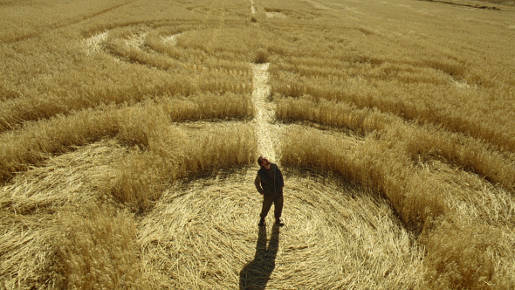 Why me?” just before the camera pulls out to reveal that the crop damage is, in fact, crop circles that spell out: “Should’ve gone to Specsavers”. The spot was directed by Sonny London’s Guy Manwaring in very ad-libbed style. The central actor was carefully cast to ensure he could adlib by fully embodying the character. Outtakes were used to create an unbranded enigmatic ‘teaser’ viral which sees footage of the farmer talking about aliens and ends with “Coming soon: ITV 24 Jan 8.35pm”. The crop circle end line was filmed in camera, using a team of 20 people to create the circles based upon bespoke artwork specially devised by a hand lettering artist. The Crop Circles campaign was developed at Specsavers Creative by managing director Richard Holmes, creative director Graham Daldry, copywriter Xara Higgs, art director Michael Hutchinson, producer Sam Lock, planner Timothy Langlois. Filming was shot by director Guy Manwaring via Sonny London with producer Alice Grant and director of photography Nanu Segal. Hand Lettering Artist was Alison Carmichael at Jelly London. Post Production was done at Finish. Editor was Mark Edinoff at The Quarry. Audio post production was produced by Simon Capes at Clear Cut Pictures. Media Planner was Pam Fell at i-level.